I make no promises that I will be around here much but at least today, I've had a chance to visit and I'm really excited. It's been a terrific day - I sorted through my bookshelves (which were an abyss and which was like spending time with old, dear friends), we played games with the kids, we watched a movie together as a family and I even found time for a nap in the chair in the living room. It was the kind of quiet day that we NEVER manage to have. I couldn't think of a nicer way to start a new year (and a new year that ends in a 4, my favourite number!). 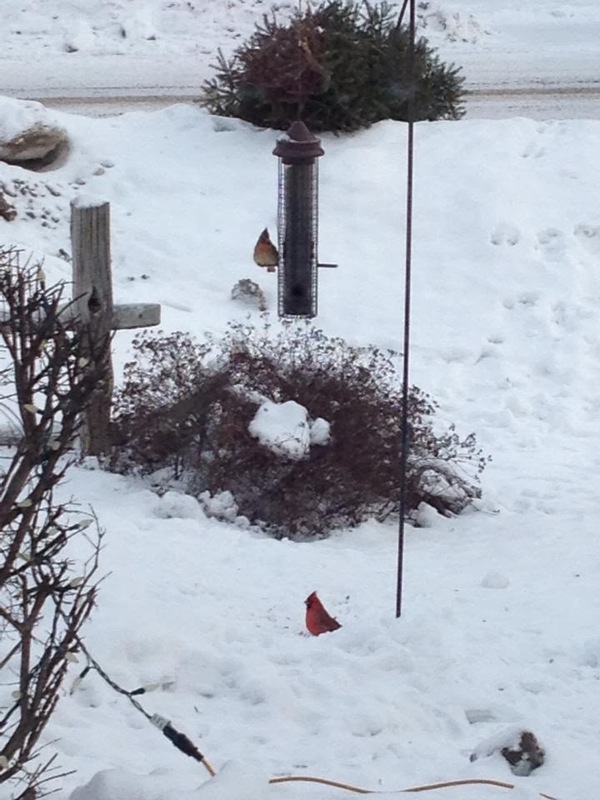 I only managed to capture 2 but we had four cardinals who spent probably 30 minutes at the feeder (along with a persistent squirrel!) Cardinals are my favourite birds and given that I had a friend tell me a wonderful story about cardinals who are a sign of God's presence, it seemed like a great way to start the year. What a restful start to the year. I love the birds!! Happy New Year to you, too, Jill!